With the start of the holiday season, friends sometimes ask me to create paintings to give as gifts. This year, my friend from college wanted to give her husband a painting of his favorite species of deep sea urchin, Echinocrepis. As a marine invertebrate biologist, he worked on these very cool echinoderms. In addition to Echinocrepis, she also wanted the painting to feature a sea pig. Because... sea pigs! The challenge here was that there are so very few (only 2 or 3) reference photos and videos of Echinocrepis. 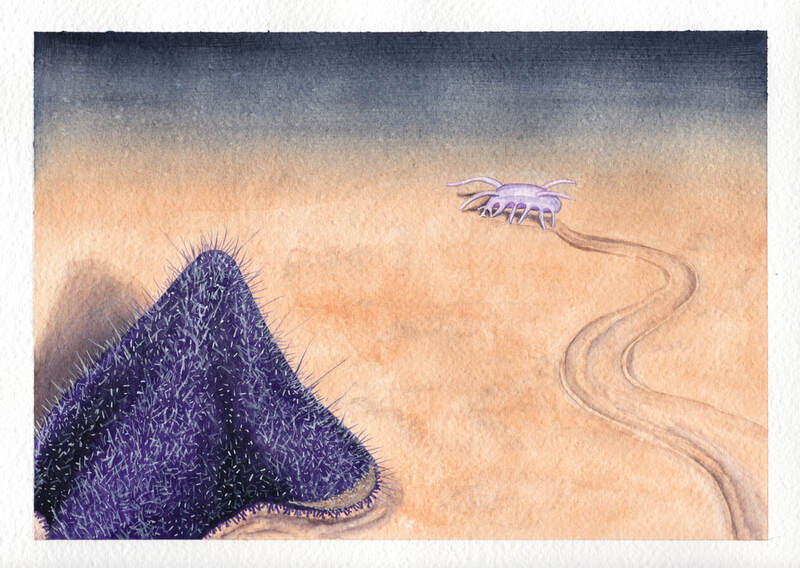 I used a combination of watercolor and gouache to create this deep sea landscape and show Echinocrepis in the foreground and the funny little sea pig foraging in the background. The Life Science Studios website has a new makeover! You can now see details on completed projects, including the full pages where illustrations have been published in journals or magazines. I will continue adding more projects to the portfolio with some of my digital work and personal paintings soon. I have also created a store page that displays a few of the items for sale on my Red Bubble shop. As I add new items, I will feature them on the store page so they can be found more easily. You may also notice an Instagram feed on the Updates page here. It has been fun uploading progress photos, time-lapse videos, and new products on the @lifesciencestudios Instagram feed. I hope you will follow along! I have not updated this blog for a long time, but there is a very good reason for that. In April, I gave birth to my beautiful daughter, Livia. Since her birth, I have been learning to balance working and being a mom. I was able to take maternity leave, and now I am back to work illustrating African cichlids and a few other projects. This past weekend, I took the whole family to Antwerp, Belgium for the AEIMS (Association Europeenne des Illustrateurs Medicaux et Scientifiques) meeting. 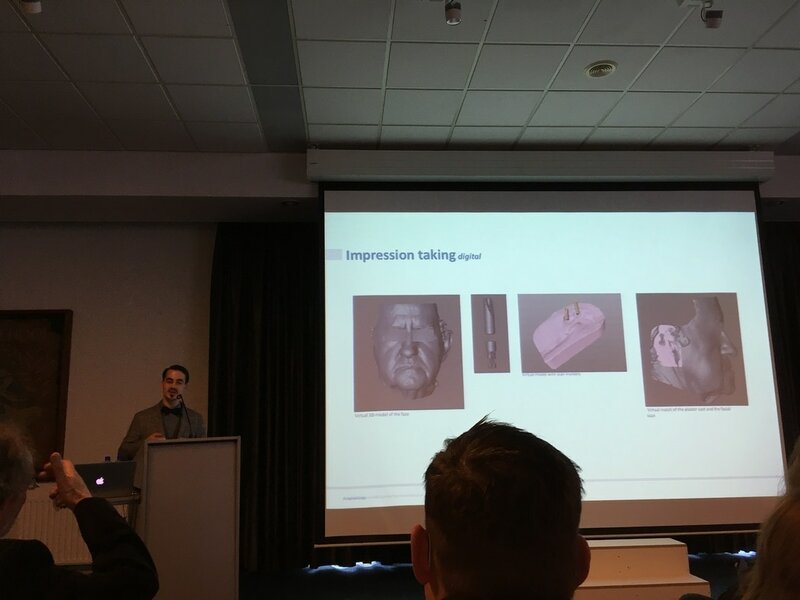 It was nice to see some familiar faces from last year and to meet new people doing interesting and innovative work in the field of medical illustration. I spent the first day at the beautifully woodsy Wilrijk campus where two rooms were set up for sketching. One was for human anatomy and the other for comparative animal anatomy. I don't consider myself a squeamish person, so I was a little shocked that I found it difficult to stay in the human anatomy room. I had expected dried cadaver specimens, but the university provided us with a dissection of very fresh arms and legs. Medical illustrators often observe surgeries and dissections, so they were very interested and less shocked than I. I spent my day with the animal bones instead. The second day was full of talks from a wide variety of people from heart surgeons to sculptors to forensic anatomists. One of my favorite talks was by Carlos Van der Perre. The natural history museum in Brussels houses a mammoth skeleton that was discovered in Lier, Belgium. Van der Perre and his collaborators wanted to bring the skeleton back to Lier, but it could not be moved because of its age and fragility. Instead, they decided to 3D print the skeleton for display. They took each bone and did surface scans in order to collect the data necessary to print the skeleton. Then, using a company that usually prints large items for industry, they printed all 320 bones, finished them, painted them, and then put them up on carbon fiber posts for display in Lier. The printing process took two continuous weeks of printing to complete. While this was a mammoth undertaking, it shows how 3D technology could be used for museum displays and replication of fossils or other artifacts. 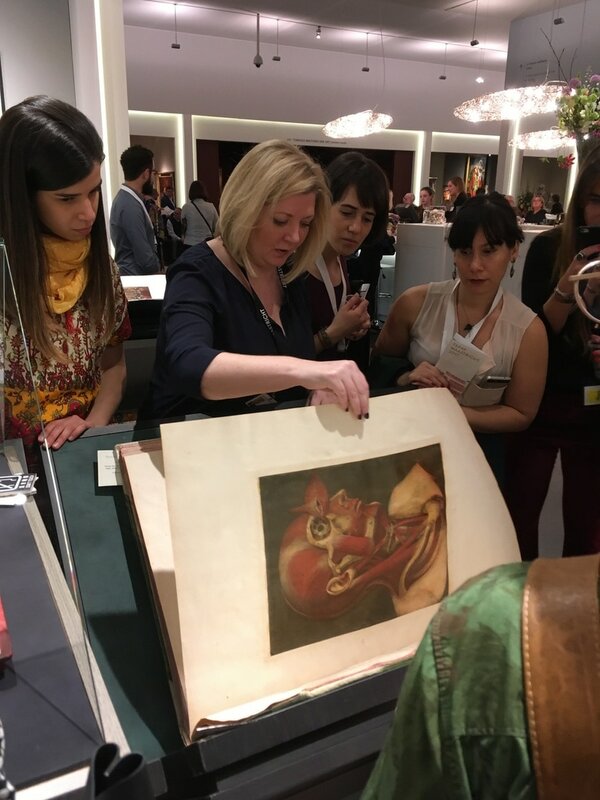 The AEIMS conference is primarily for medical illustrators, but the process, collaborations, and challenges faced by medical and natural science illustrators are very much the same. 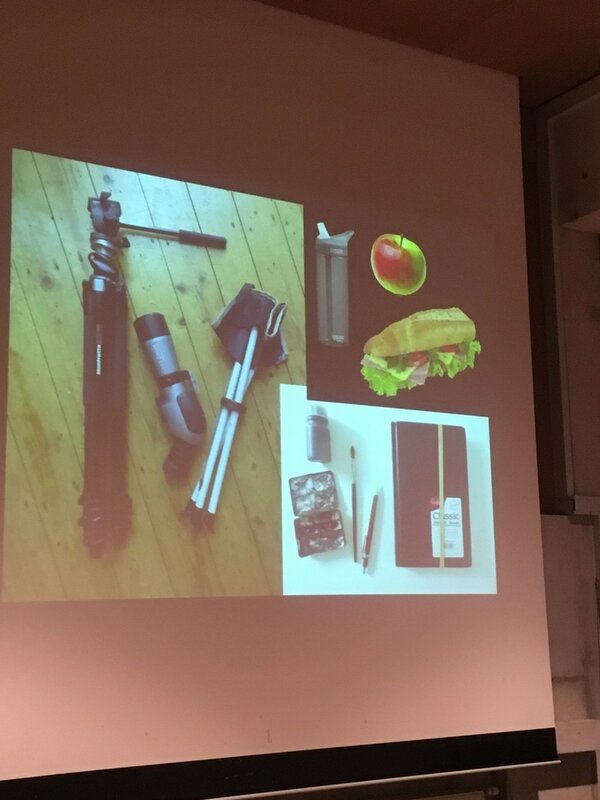 This past weekend, a group of talented science and medical illustrators and students assembled in Maastrich, the Netherlands, for the 26th annual conference. 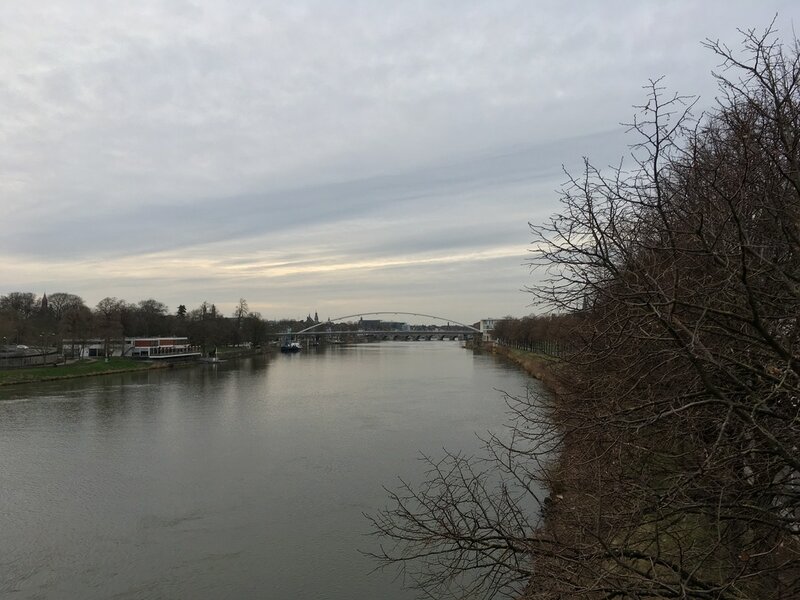 I have attended several conferences for the Guild of Natural Science Illustrators, and now that I am in living in Europe, it was wonderful to meet European illustrators and learn about the education programs here. On the first day, we assembled at the Hotel Management School for our first round of talks. Several of the lectures centered on history. Bill Andrews of Augusta University and Lorraine Daston of the Max Planck Institute demonstrated the importance of illustration through time. Illustrators have worked closely with scientists throughout history. The images they created not only founded our knowledge of anatomy and biology, but also had a great influence on the science that came after. Scientific images are always the product of four eyes; the scientist's and the artist's. As a result, every scientific or medical image leaves a trace of conflicts in differing epistemic virtues of the people involved. Esmee Winkel, from the Naturalis Biodiversity Center, then gave us some modern examples of this type of conflict in her work with botanists today. We also heard from medical illustrators. Stephanie Pilippaerts and Maarten de Jong showed us the importance of medical illustrators for doctors and patients. Stephanie completed a project using illustration to teach doctors how to conduct repair surgery techniques for hypoplastic left heart syndrome, a devastating heart defect. Maarten then demonstrated how he uses science illustration techniques to create prosthetic ears, noses, and eyes for patients. This year, the conference was held in Maastricht during the prestigious TEFAF art and antiques fair. 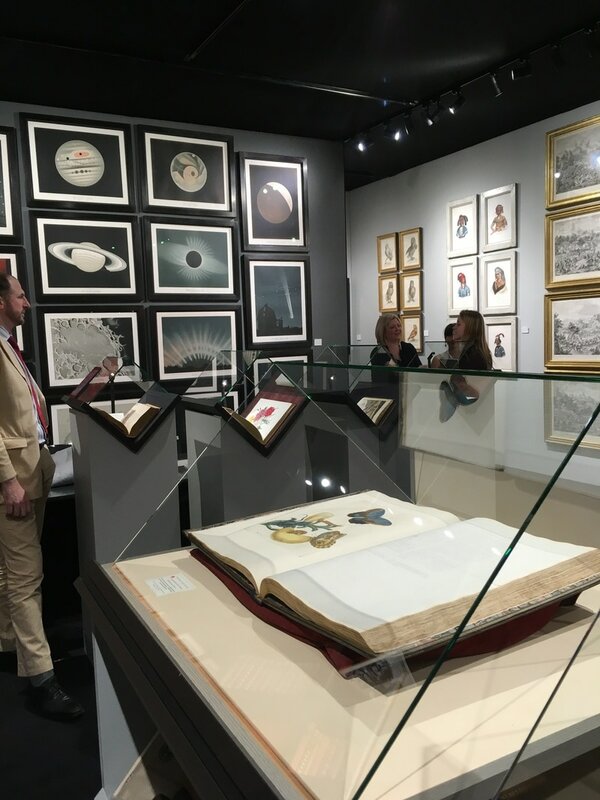 ​After our talks, we had the opportunity to explore the giant TEFAF exhibition. We quickly narrowed in on historic science illustration. 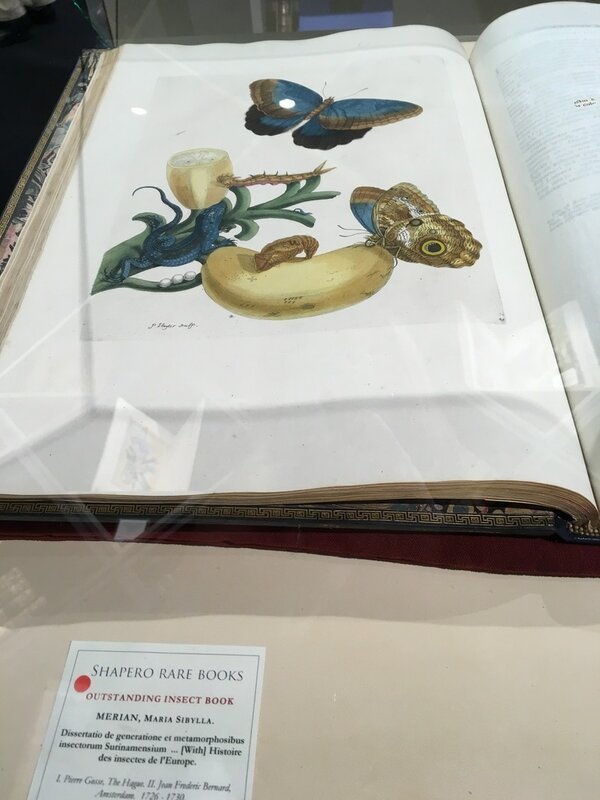 I thoroughly enjoyed seeing the rare books, illustrations by Maria Sibylla Merian, hand-painted lithographs of birds and mammals, and spectacular anatomical paintings by d'Agoty from the 1700s. 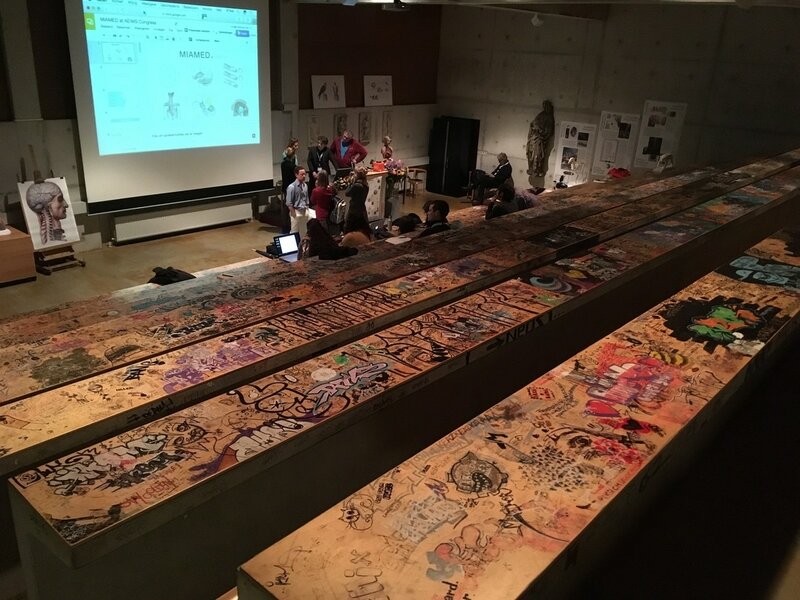 On the second day of the conference, we met at the Maastricht Academy of Fine Arts and Design in a classroom that was clearly an art classroom. The tables were covered entirely in spectacular doodles from art students through the years. We heard about a number of exciting science illustration programs in Zurich, Dundee, France, and a fledgeling program starting this year in Spain. One of my favorite talks was by a new freelance illustrator, Jessica Koren. Jessica is a medical illustrator and presented us with a beautifully honest talk about sticking her neck out, piloting her business, and overcoming fears in order to grow. I think we all responded to her talk because we all share these fears, doubts, and challenges when finding clients and valuing our work. One of my favorite tidbits from this talk was her method of keeping a Captain's Log for her projects, writing down all that happened, went wrong, and how to fix it next time. Our lectures that day also included a very engaging talk by paleontologist Anne Schulp, who let us touch a model of a T. rex tooth and T. rex skin impression. It is remarkable to see how much our images of dinosaurs have changed even since I was a kid. Anne took us through many of the really cool methods that paleontologists use to figure out everything from dinosaur diet, coloring, behavior, and even mating dances. It is amazing what you can learn from tooth enamel! We also heard from Pancras Dijk who gave us a window into the history and editorial process at National Geographic. While most people immediately think of stunning photography when they think about National Geographic, the magazine relies heavily on information graphics to tell stories, bring the past to life, and visually communicate complex concepts. Pancras presented a very clear argument for why illustrations are so important and how they accomplish communication in a way that photographs often cannot. 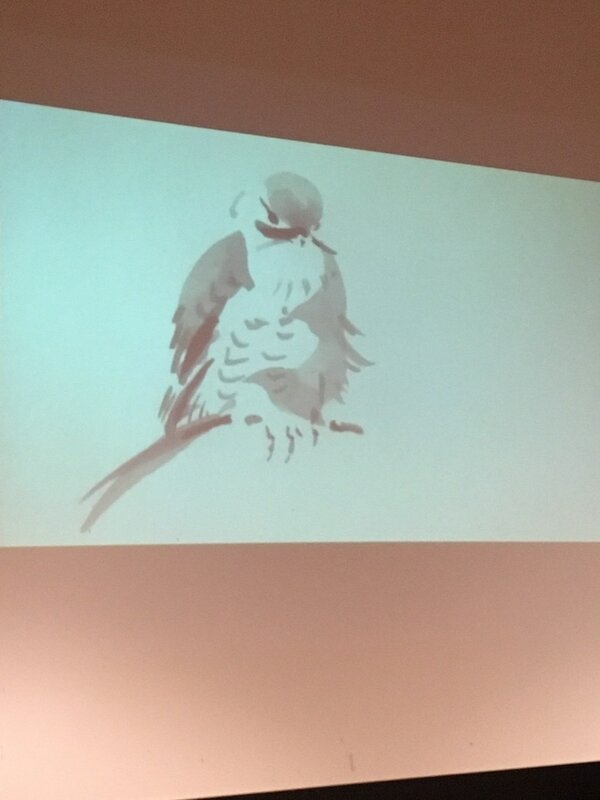 Our final talk came from Erik von Ommen, a bird painter, who showed us beautiful videos about his process. His talk was very inspirational as he explored many techniques including etching, wood cuts, watercolor, sumi-e ink, oil, and even gold-leaf. His advice is to take risks, show who you are, and don't be afraid to think outside the box. "You have to finish a fish? Did I hear that right?" my friend asked when I told her why I was running late. Yep, I have been painting fish every day since I moved to Switzerland. This latest batch of fish will accompany a new research paper on fish evolution, and this project follows a previous research paper by the same group that had me painting around 65 different fish species. The greatest part about working with the Alfaro lab at UCLA is that my painting assignments include some of the world's weirdest, rarest, and most beautiful ocean fish. That also means it can be a bit challenging to figure out how to accurately represent fish that have rarely been photographed. 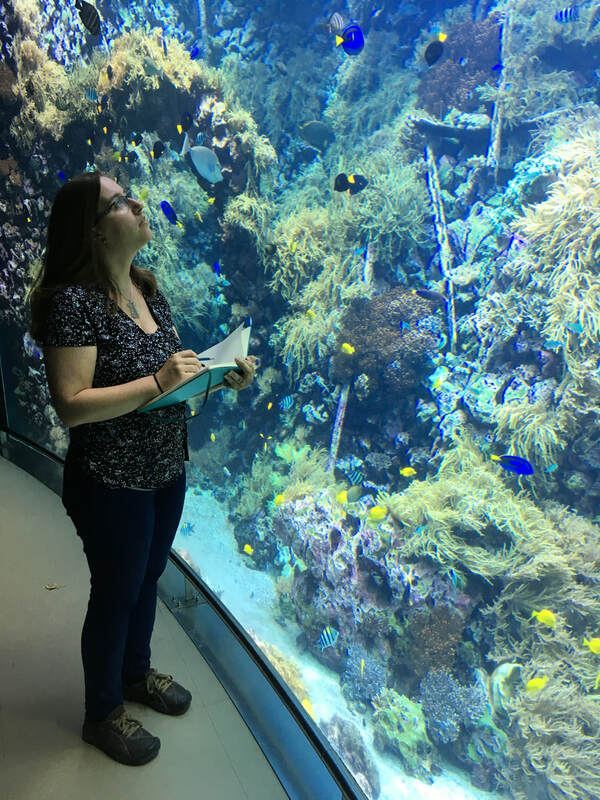 Each species requires a lot of research in order to make sure the illustrations depict accurate morphology and coloration. I start with Fish Base online, a website that includes descriptions, illustrations, and photos of fish species from around the world. Many of the photographs are of dead fish, which works well for understanding the anatomy, but results in dull or false coloration and often damaged fins. Further online research helps provide live photos of the fish in most cases. One of the most challenging fish to paint was the tube-eye fish, Stylephorus chordatus. This species is a deep sea fish that looks like something out of an alien movie. It is rarely seen and there are very few photographs. My illustration had to be based off of the very limited number of illustrations and photographs I could find. I did not have a clear sense of what the coloration should be, but some of the deep sea researchers I asked described it as silvery-black. Most of the fish species are much more straightforward. For example, there are endless photos online of pink salmon (Oncorhynchus gorbuscha), and I have the advantage of having caught salmon recreationally for most of my life. I had a pretty good idea of what it should look like. For all of the fish paintings, I always start with a number of reference photos to create the most accurate sketch of the animal. After sketching on the computer, I then print out the sketch and refine it on paper before transferring it to watercolor paper using carbon paper. I can then use layers of watercolor followed by white gel pen to create the coloration, texture, and highlights. ​Here is only a small sampling of the 80+ fish that I have painted so far. Stay tuned for links to the research publications once they come out. They are sure to make a big splash! I don't often receive requests for logo design, but I really enjoy the challenge of creating a single image to explain the ideas and goals of a project. Biologists at Princeton recently asked me to design a logo to represent their research on North American canine genomics and evolution. This collaborative project incorporates researchers from multiple institutions in order to explore the genetics of canine populations across North America. For this logo, I worked with the project's Primary Investigator, Bridgett vonHoldt, to better understand what the image would need to convey. I then presented the group with a number of roughly sketched designs. Design number 3 was the group's favorite, but it needed to also include the words "North American". I then used Adobe Illustrator to complete the final illustration, choosing a black and blue color scheme to match the project's website. Learn more about the Canine Ancestry research group at http://canineancestry.princeton.edu/home.html. You can also follow the project Twitter feed @k9ancestry for the latest news. I am excited to announce that I have taken the plunge and become a full time freelance illustrator from my new home in Zurich, Switzerland. 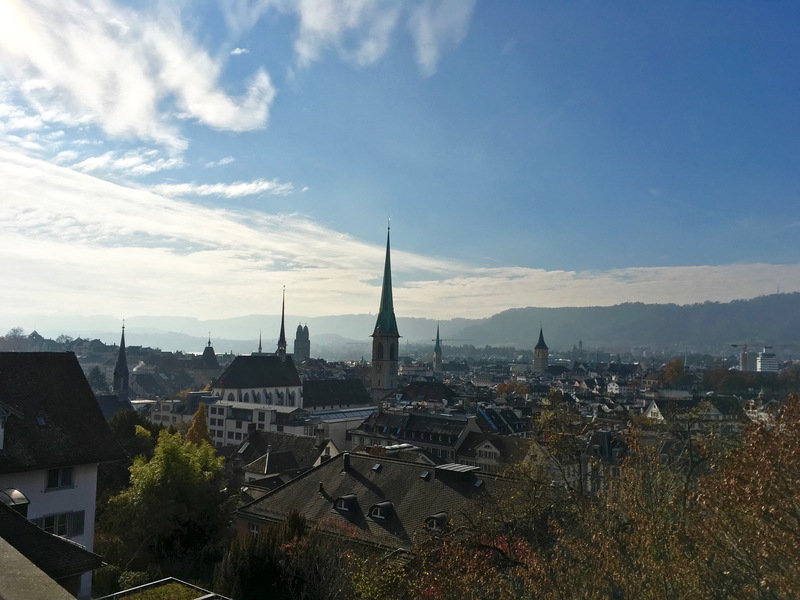 Earlier this month, my husband and I moved to Zurich, beginning our new adventure as expats in Europe. This move is a great opportunity to expand my business and pour more time and effort into art and illustration. Move to Switzerland in November!? Who would be that crazy? I thought this would be a terrible time to move. Cold, snowy, dark, rainy. The start of winter would surely make me miss California too much. It turns out, however, that I moved here during peak mushroom season and at the start of the festive Christmas markets. The city is sparkling with lights and the forest is loaded with fungi! Bundled in enough layers, this Californian can enjoy it all without freezing. Before leaving the states, I decided to make my business an LLC, mainly for legal protection and to build it as its own entity, separate from myself as an individual. This was easier to do than I thought it would be. Naming the business was probably the hardest part. I changed my name from Himes to Johnson, and it turns out there are a lot of Johnsons out there. Finding a business name using my new name was tough. I spent a lot of time thinking about the name, coming up with many duds, and asking friends for suggestions. Having worked as a biologist and lab manager in Life Science departments throughout school and career, I decided this was a fitting title and encompassed the type of work that I do. I was able to then register the business as an LLC by simply filling out the forms online, and then I changed the URL of my website. Next task: new business cards. As I start on this new chapter, I am aiming to build Life Science Studios, LLC into something meaningful, artistic, and valuable for biologists and their audiences. I believe illustration can be an important tool for communicating science, and I hope to do that from my new art studio in beautiful Switzerland. Be prepared for more frequent blog posts, lots of mushroom paintings, and pictures of Alps thrown in every once in awhile! 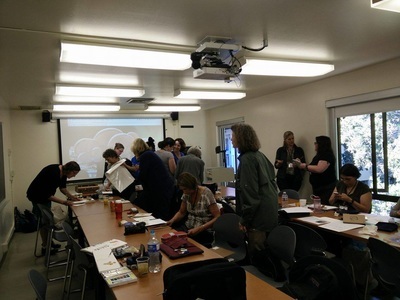 This summer, I attended the annual Guild of Natural Science Illustrators conference in Santa Cruz, CA. Every July, the GNSI members gather for a week of seminars, keynote speakers, workshops, and field trips. We learn from each other, and I always come home with renewed inspiration and ideas. This year, I participated by teaching a mini-workshop on painting mushrooms in watercolor. 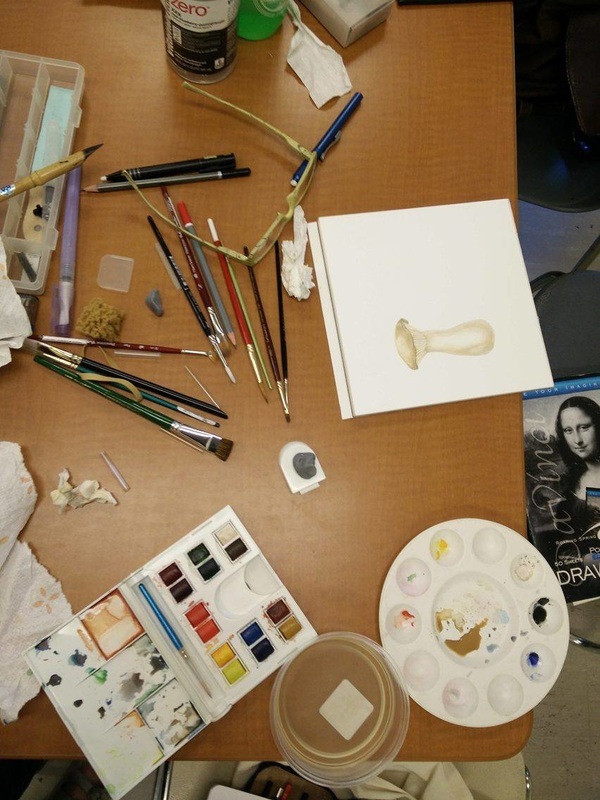 The workshop filled up fast, and I had a wonderful group of artists. Unfortunately, July is not mushroom season in California, so I was not able to go foraging. Instead, I stopped by our local mushroom farm, Far West Fungi, to pick up specimens of lion's mane, oyster, shiitake, and other beautiful fungi. Each student picked out their favorite specimen from the box. 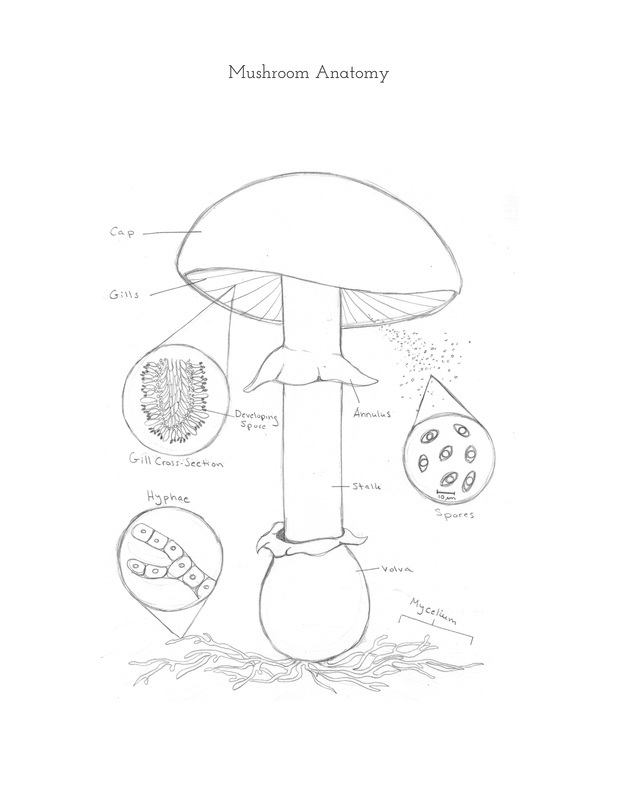 I spent some time explaining the different parts of the mushroom and also a little about fungus ecology and safe practices for foraging. I then did a quick tutorial on the steps to painting a mushroom, focusing on which characters to pay attention to when making an accurate sketch. When I paint mushrooms, I like to use dry brush techniques to achieve textures. I also use a white gel pen for highlights, which comes in handy when painting some of the slimiest fungi! We spent some time practicing these techniques. ​​ What a really fun experience! I might have to do more workshops when mushroom season starts up. I am excited to announce my partnership with the very talented ladies at B&K Crafts. 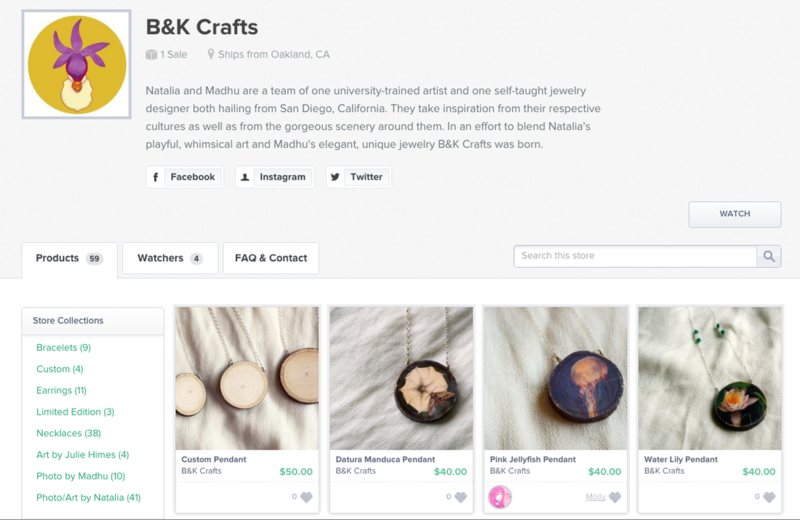 Natalia and Madhu are local artists and jewelry makers who love to incorporate Bay Area nature into their unique wood pendants and earrings. Please check out their online store on Storenvy to see their beautiful creations, and if you browse through the selection, you just might see a couple of my own paintings now in a wearable form! By mid-November, the first soaking rains fall in California and the temperature begins to drop. Members of the Mycological Society of San Francisco (MSSF) watch the weather forecast closely, hoping for a downpour so that mushrooms will blanket the forest floor during their annual trip to Mendocino Woodlands Camp. ​These mushroom hunters are scientists, hikers, chefs, and artists, brought together by a love for fungi. They are all there to enjoy the woodlands, to eat prized mushrooms, and to nerd out over beautiful, unusual, and delicious fungi. Every year, new people join the MSSF, and I was one of those new people last year. In 2013, a mycophile friend of mine suggested I paint a series of watercolor mushrooms for the MSSF’s annual Fungus Fair. 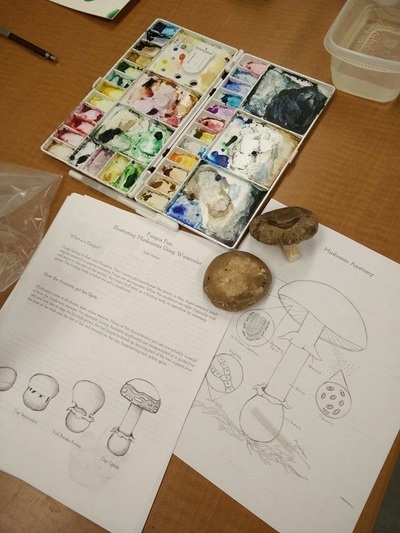 To prepare, I started going on forays with him to learn about fungi and painted some of my favorite species. I set up a booth at the fair in San Francisco that December to see if I could sell a few prints and cards of my paintings. I received a warm welcome from Curt Haney, the president of the club, and he asked if I would paint a poster design for the next year’s fair. In exchange, I would get a free ticket to mushroom camp. Mushroom camp? You mean, drive six hours up the coast to camp in the woods with a bunch of mushroomy strangers? I said yes, and also asked my mycophile friends if they wanted to come along. The experience was incredible. It felt like we had walked into a mushroom wonderland! We left camp that winter with a car full of chanterelles, candy caps, and boletes, and our calendars marked for next year’s camp. ​Excited for my second trip to mushroom camp, I leave my office in Monterey this past November and drive up the coast through San Jose and San Francisco. The drive is a spectacular gradient from busy bustling city to peaceful quiet forest. I arrive just in time to eat the night’s meal; lasagna with king trumpet and maitake mushrooms, and chocolate brownie with candy cap creme (mushroom enthusiasts know how to cook!). I meet up with my friends and we haul gear up to the cabin. Our cabin is rustic with a sense of history. Built in the 1930’s, the cabin is made of redwood from the surrounding land and a has a sturdy stone fireplace. We sleep on cots around the fire, four in our cabin. The following morning, we gather for breakfast (biscuits with porcini gravy of course) and split up into smaller groups to hike and forage the surrounding area. 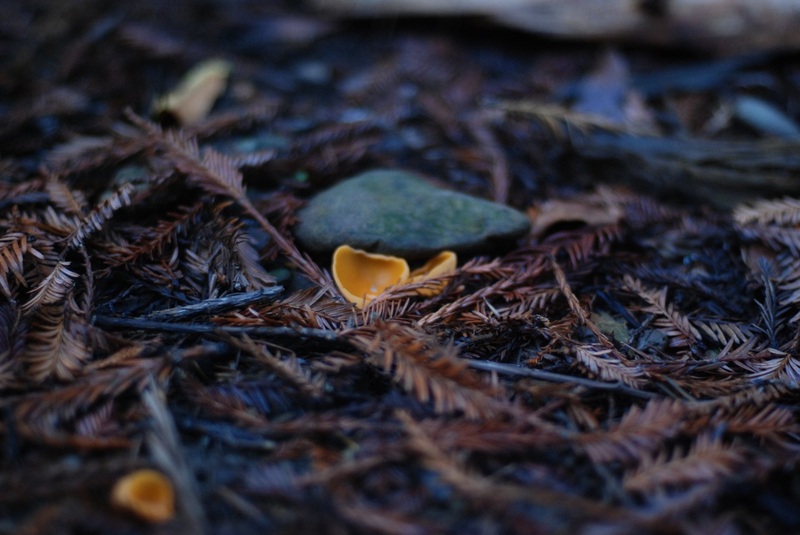 Mendocino is known for its mushroom diversity. 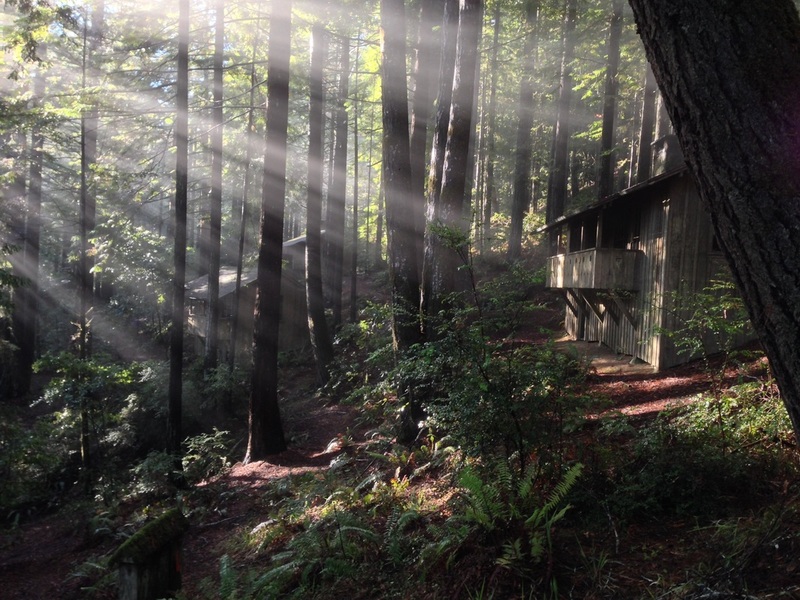 During a good year, hundreds of species can be found in Mendocino Woodlands State Park. Last November, the MSSF campers found over 300 species in a single day. This year is not a “good” year. With the ongoing drought, we haven’t seen enough rain to bring out the mushrooms. While last year was filled with diversity and lots of edible mushrooms, this year is characterized by a many very tiny species. We hike most of the day, collecting anything new we find, always keeping our eyes open for a tasty chanterelle or prized porcini. After the forays, the campers gather at the Dance Hall to turn our haul over to the experts who identify each mushroom and display them on labeled paper plates. Seeing all of the species side by side is striking. There is so much diversity of form, color, and size. That night is spent eating wild mushrooms around the campfire, chatting about our best mushroom hunting days, and attending a talk by mushroom expert, Gary Lincoff. As we collapse in bed, the rain begins to pour outside, and we all dream about the mushrooms that have been waiting underground for the rain. 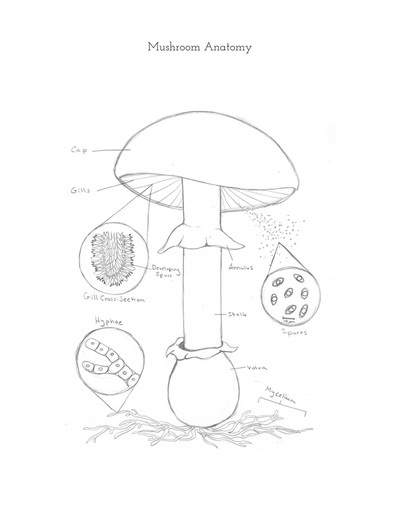 This Sunday, December 6th, the MSSF will host its 67th Fungus Fair at the San Francisco County Fair Building in beautiful Golden Gate Park. My fellow mushroom hunters will spend all day tomorrow foraging in the Bay Area to bring examples of our local diversity to the display tables. I too will be there with my watercolor paintings and to share in the excitement for this winter’s mushroom season.